How do you think John Carter should have been marketed? 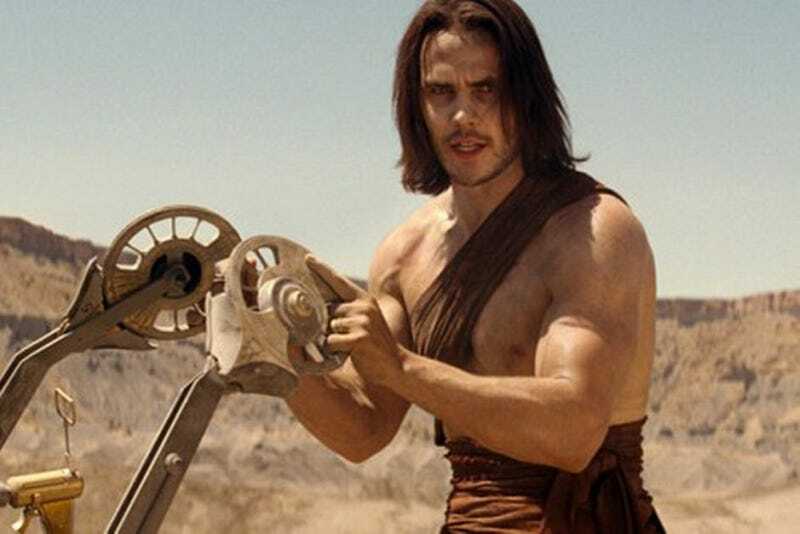 Based on a century-old character created by author Edgar Rice Burroughs, "John Carter" was meant to appeal to young males. But a surprisingly older crowd turned up to see the movie this weekend, as 59% of the audience was over age 25. Those who saw the film — a 64% male contingent — assigned it an average grade of B+, according to market research firm CinemaScore. Also hurting matters was the generic title, which Disney shortened from "John Carter of Mars" with the reported belief that "of Mars" would turn off female moviegoers. But Mars is the project's major selling point. Without it, the movie became a sphinx to the general public. Who is John Carter? Where is he? Why can he leap great distances? I understand the desire to not reveal too much of a film's story, but these are basic questions that weren't answered by Disney's advertising until right before "John Carter's" release. By then, it was too late. Consider the intragalactic evidence! Last year's animated feature Mars Needs Moms was a famous bomb so big that it took down an entire company. The early-aughts rush to pump out expensive Mars movies was just as disastrous: Mission to Mars barely grossed $60 million, Red Planet took in around half that, and Ghosts of Mars was such a demoralizing failure that it took director John Carpenter nearly a decade to make another feature. One of the Rock's rare flops? The Mars-set Doom, which only made $28 million. The lowest-grossing Tim Burton movie of the last fifteen years and change? That'd be Mars Attacks! The John Cusack drama The Martian Child wasn't even set on Mars, and it, too, is the lowest-grossing wide-release movie Cusack has made in the last fifteen years... it seems the red planet will have to fall back on its one unmitigated success: Total Recall, the 1990 Arnold Schwarznegger classic that's heavily set on Mars. When push came to shove on "John Carter," Mr. Stanton usually got his way. One area in which he exerted his influence was marketing, where he frequently rejected ideas from Ms. Carney and her team, according to people who worked on the film. He insisted, for instance, that a Led Zeppelin song be used in a trailer, rejecting concerns that a decades-old rock tune did not make the material feel current. Mr. Stanton also was behind the selection of billboard imagery that fell flat, and he controlled an important presentation of footage at a Disney fan convention that got a chilly reception. — New York Times article in which Andrew Stanton is hung out to dry. Foreign reviewers and press aren't as inclined to jump on the mainstream U.S. press bandwagon of establishing a narrative about a film and then sticking to it no matter what - so it's likely that, instead of seeing pre-release journalism eagerly betting the film would fail, and then post-release journalism sticking to the "it's going to fail" hope, foreign audiences saw a lot more reviews and reports related more to the film's actual content and quality with less guessing about the budget and less attempts to one-up each other on clever jokes against the film. Everyone is quick to point out that John Carter did not make any money. It is a flop, a failure. Domestically, the opening of John Carter is indeed very soft for the budget. However, big event movies like this are international affairs and a $70 million opening outside of the USA is no small feat. As a popular book series, the Carter adventures have a global fan base. This cowboy might have some legs underneath him in the long run, which is the only run that matters. Titanic did not break all box office records in the first weekend – it ran. And ran. And ran. For weeks into months. It stayed in theaters, pulling in money week after week. Stanton's film has a long road ahead of it, but pulling in $100 million in the first weekend is a decent first step towards recouping the budget. — Robert Fure, Film School Rejects.